Manchester United ran out deserved winners in their opening fixture of the Champions League, but star player Paul Pogba had to come off injured. Jose Mourinho’s team got off to a winning start via a 3-0 victory over Basel in their Champions League campaign for the season. Fellaini, Lukaku, and Rashford were all on the scoresheet, as Manchester United breezed through at Old Trafford. However, the hamstring injury to key player Paul Pogba dampened the euphoria around the win, and the French midfielder appears set for a lay-off with the injury. The record Premier League signing pulled his hamstring in the 19th minute whilst trying to tackle a Basel player. Pogba was immediately substituted by Fellaini, who was the scorer of the opening goal of the game. Pogba looked gutted with the injury, as the captain for the night had to come off unceremoniously early in the game. There are reports that the France international was seen leaving the stadium on crutches, which is a bad sign for the club and its fans. 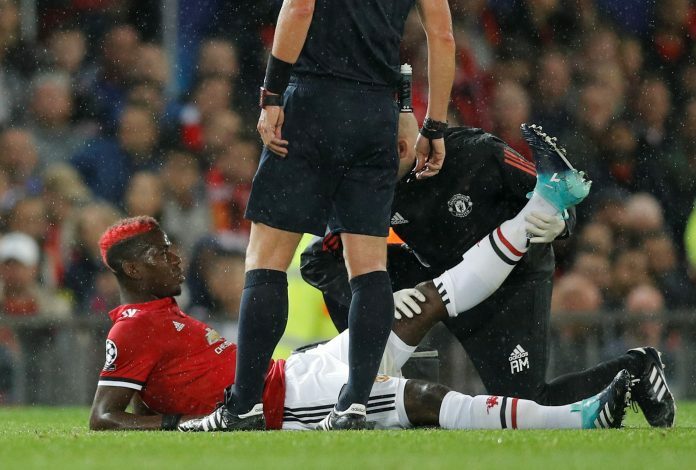 It looks like Pogba could be out for almost a month, as is the case with most hamstring injuries.